Costa Ricans have a very healthy diet. Breakfasts are always hearty, lunch is always a well balanced plate and dinner usually the lightest meal of the day. Fresh produce gathered at the weekend farmers markets provide the base for the weekly menu. A visit to one of these markets is a real treat. Strawberries picked from the flanks and fields of the Poas Volcano, cheese from the dairy farms of San Ramon and handmade Costa Rican tortillas from the Provence of Cartago can all found here amongst a kaleidoscope of fruits and vegetables, some familiar others not. Peak into the refrigerator of most Costa Rican homes and you will find bottled beverages replaced by pitchers of freshly made fruit juices like maracuya (passion fruit), carambola(star fruit), naranjia, Cass, Tamarindo, flor de Jamaica and many others. You are sure to also find a container of cooked white rice and another of prepared black beans, this for the staple dish eaten daily called Gallo Pimto. Topping the list at number one, Gallo Pinto. This is a savory rice & beans breakfast staple. No matter what your economics are or where you live in Costa Rica, chances are Gallo Pinto is on the breakfast table along side ... Which brings us to #2 number two on our list, Salsa Lizano. This tangy "party in your mouth" condiment is used in many dishes but most commonly with Gallo Pinto. 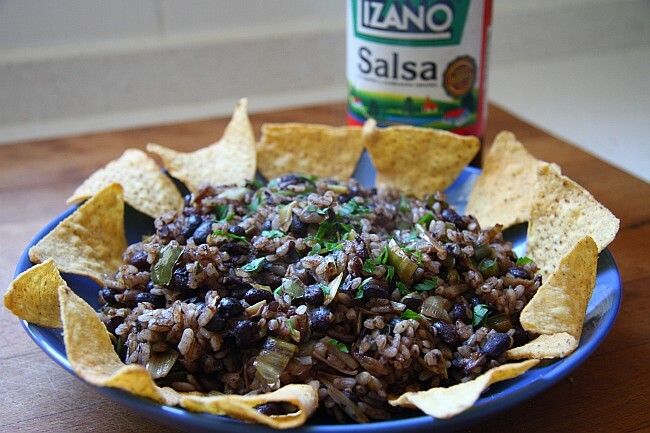 Pour a little on top of your Gallo Pinto, you'll be glad you did. Bring some home, it's found in every supermarket and pulperria (produce/mini market stands) throughout Costa Rica. Ceviche and Chifrio tie for 3rd place. With an abundance of fresh seafood, Costa Ricans have authored a very unque way of preparing this popular dish. Fresh diced sea bass tossed with lime juice, minced onions, sweet bell peppers and cilantro served with Soda crackers makes for delicious appetizer. Ceviche is the most popular seafood dish in Costa Rica. Chifrio truly endemic to Costa Rica and traditionally served at local cantinas and bars is a hearty bowl layered with rice, beans (cubasis), pieces of chicharron (fried pork), pico de gallo, avocado and crispy broken tortilla chips crowned with a spicy vinegrette. You won't find this dish anywhere else in Latin America so make sure you try it on your next trip to Costa Rica. Travel to Costa Rica with us!